Gerard Way former frontman of My Chemical Romance explained how he went from rock to comic books via Grant Morrison’s Doom Patrol in the Guardian this week. Virtual reality meets Magna thanks to Square Enix in an article in the Rolling Stone. The Marvel Age of Comics 1961-78 is covered in pictures in the Guardian – featuring the Hulk, Avengers, Iron Man, Spidey and more. Swansea landmarks have been brought to life in comic book form according to Wales Online. The Comic Business is alive and well in New York this week at the Comic Con. Archie Comics have signed a licensing agreement with Comic Con India according to the Economic Times and comic graphic novels have seen a big increase sales wise, up 15% in three years, according to PR Web. The Liverpool Echo also report what it’s like to work in a comic shop this week – read all about it here. You can also read in the Greenock Telegraph about a comic book project for the over 65’s that has received a £7000 Postcode Lottery Grant here. Metro US explain why Willem Dafoe returned to comic book movies, after his performance as the Green Goblin in Spider-Man. He is now to play Vulko in Aquaman. Also returning to comics is Charlie’s Angels, according to the Hollywood Reporter. The Archies are also set to meet the Monkees. If that wasn’t enough nostalgia the Prisoner is returning too. On the BBC this week you can hear about the return of Roy of the Rovers. There is also a mini documentary about Dan Dare. Both features are about 20 minutes in to each programme. Finally for our media round up this week we leave you with a write up about the Lakes Comic Art Festival and the ComicCon at Loch Lomond in Scotland this week. 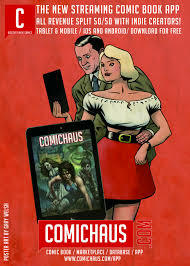 Got any media stories you want to share with us – e mail comicsflix@gmail.com, tweet is @comicsflixukus or #comicsflix . You’ll also find us on facebook and Instagram and here on our website.